People in Poland have played Jugger for years, but it was never a league – just a bunch of friends who met at a postapocalyptic convention, and decided to play a casual game of jugger. With growing knowledge about the game (convention brawl audiences wanted to play, people who weren’t there kept asking about „that game in a picture”) and demand for standardised rules we decided to start the Polish Jugger League. Who are we? It all started with OUTPOST leading games, and propagating Jugger among people, but over the time several others joined. 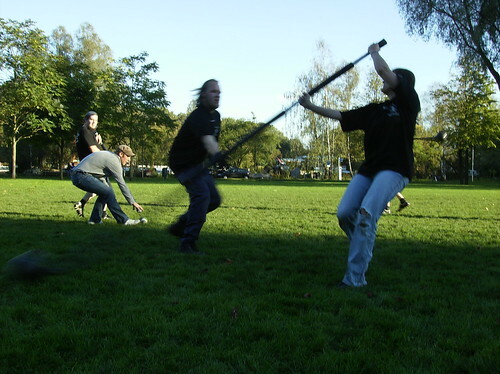 Now we are in the process of establishing our own rules and overcoming attendance issues – in our country we play Jugger during conventions that take place in different parts of Poland, and most people cannot attend every single one. How do we play it? We play it rough. You can see it in the videos - bruises and small injuries are the part of the game... and they look cool! Similar to Czech games, different pieces of armor are allowed, so players can customise their looks and equipment, and our game footage looks more like scenes from original Blood Of Heroes movie. Knowing the fact that we play in different areas, our jugger fields vary, depending on space availability – sometimes the field is smaller than we would like it to be, sometimes we play on grass, sometimes on tarmac, sometimes on sand... we had to play in the forest once – and just imagine how hard it was for chain enforcers! And that someday our League grows stronger and we will be able to play games with juggers from other countries. The first translation of the German Rulebook has been released! A team of people worked together to make the German Rulebook available in English for all Jugger players. 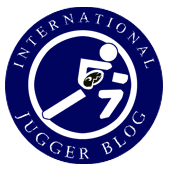 We hope it will help Juggers who come to Germany to play, and also people with an interest in the German Rules. The rules can be found on the jugger.org community site, under 'English Version' for the translated version. A few weeks ago I heard of Jugger in Austria, espacially in Vienna so i asked them for an introduction and a few pictures and here is it all for you. memories of amazing days we shared cross our minds. "Jugger? Can't be explained. Must be played!!" ... and the two founders. A few months ago when I came back from a training I though about all that stuff that we discuss very often. But in the four weeks I spend in Dublin we had not one discussion like this. So I started to compare the Rulebooks. The version of the irish Rulebook I used was written by Peter Houlihan. This version isn't final but there will be an election about his Rulebook. The first player to hit the other wins, no matter how close behind the other player was. However if two hits land so close together that the gap between them cannot be distinguished they are considered to have „doubled“ [...]. Either player may call a double and if they insist (if they call it three times or more) both players must accept the double [...]. Also, if one player hits another at the same time as they strike a third the second two players are considered hit. After a player has completed their count they must attempt to rise immediately if they are unpinned, runners are exempt from this and may stay down as long as they wish. When rising a player may block with their spar as soon as their knee is off the ground, but their hits will not count until half a stone after they have begun their rise. Well, now we could discuss if it's need's to be a half stone or if that's a too long time to rise, but in this way you don't get a discussion when you're risen or not. In my point of view that's better than the german version. Den Spielern ist es erlaubt, aus taktischen Gründen über die Strafzeit hinaus knien zu bleiben. Für die Dauer des Kniens dürfen Spieler nur gepinnt werden. Other players have the option of staying down if another spar player is already within hitting distance. For fixed spars this means that the spar player could touch the rising player without moving their feet, for chain players this means that the chain is within range and half a swing of the rising player. Only one player may be pinned with one spar at a time however a player with two short swords [but not q-tips] may pin two other players. That could be useful if you have someone who is good with two short swords. And what about the chains? In irish rules only a 180° wrap counts as a hit, and if you wrap a spar the first 360° count as a hit if the ball gets you. In my point of view we should add this to the german rulebook and as I know a few teams already handle it this way. A runner is considered to have scored from the moment any part of the skull enters the goal. Another point is that if you leave the court within the range of a chain you must get down for eight stones. And about the stones, according to irish rules a stone is 2 seconds and not 1,5 as in the german rules. Also there aren't any limitations for changing players. And the last point is that the court lines aren't part of the pitch. At the end I can say that in the german rules is more space for interpretation and that the most rules in the irish rulebook are easier. I for my part prefer the irish rulebook. Continue reading "A comparsion of the german and the irish Jugger Rulebook"
Jugger has arrived in Amsterdam 1,5 years ago. Two Jugger players form Münster in Germany moved to Amsterdam after they played Jugger in Münster for a long time. After they got used to life in Amsterdam, they started building weapons and promote Jugger. Now there are always enough players to play at least 3 against 3 or some training games. At the weekend of the 16./17. October two people (@nalfion and @p0Ldi_MS) from Münster visited Amsterdam. They brought a strong chain with them, since you can only buy chains with a small diameter in the Netherlands, probarbly the same problem as in Spain. On the first day we built the chains and on the second day we trained in the Martin-Luther-Kingpark, you can watch pictures of this training on flickr. If you want to join the training there is a doodle and a forum to coordinate the trainings, so feel free to use them and join the training. ... there is no legitimate authority which can make legitimate decisions on Jugger for the community, neither in Germany nor globally?